I'm out of town. If this opens up, will someone report back? WoodDraw wrote: I'm out of town. If this opens up, will someone report back? Just walked by this morning and it looks awesome. Does anyone know if the store's hours will be different from pre-renovation? Closing at 7PM is kind ridiculous, though I'm sure with the location there are other considerations they need to take into account. It was open as of 5:00 pm today. Still stocking some areas and the pharmacy was empty. Alcohol aisles were closed off. Was the alcohol aisle stocked at all? They stopped stocking it prior to the renovation. I'm hoping they turn it back into a more full service store in that regards. I went from buying Smirnoff to Tito's to having nothing available. Save time with gin. The two half aisles and the refrigerated cases were stocked. Appeared to be standard CVS selection. The signs did not indicate when they would start selling though. They're still doing some touch-up and restocking throughout (pharmacy included). It's definitely brighter, cleaner and more inviting, but I swear there's a south-to-north downward incline that I don't recall noticing before the reno. Store hours are likely to change starting next year, per one of the longtime employees, but it's by no means official yet. Brodees wrote: but I swear there's a south-to-north downward incline that I don't recall noticing before the reno. You are correct. 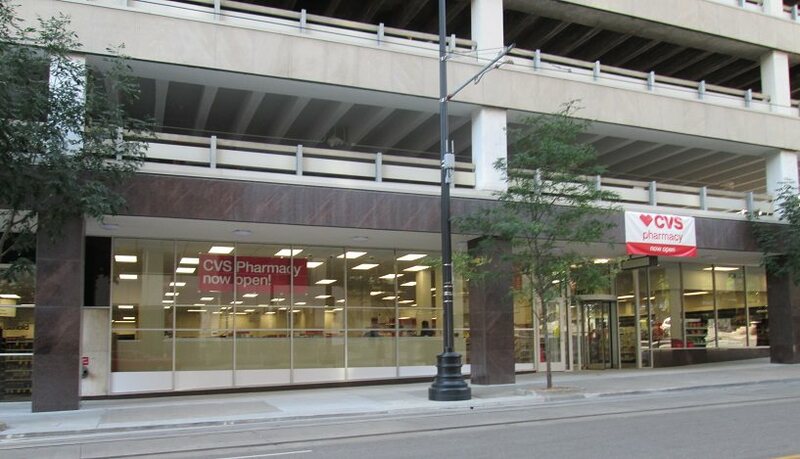 The flooring for this retail space (CVS) was built to accommodate the slight incline on Main in order to have doors on both streets (as originally designed). July 13, 2018. CVS open. I'm still out of town. Any significant changes? WoodDraw wrote: I'm still out of town. Any significant changes? It actually doesn't feel much different inside. The only things I notice are the windows and the revolving door. Got back this morning and you're right. Better alcohol section which is really nice. I feel like they're still having trouble keeping food consistently stocked which is kind of frustrating. The glass windows are nice though and it's better signage. Word is someone left a package on their stove and then turned it on. This seems to be something of a pattern among downtowners. It happened the first week One Light was open a couple of years ago. Stop putting boxes on your stove? Especially if you intend to turn it on? I'm told there is water damage to several units. Exact thing happened at Pickwick too when they opened. Flooded like one side of three floors. I was able to go look at one a floor down from the apartment that did it, and there were at least a few inches of standing water. When those pumps starts to run, they run.